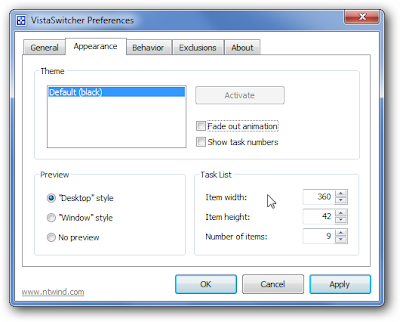 Let’s face it, the built-in Alt-Tab doesn’t have much going for it in the eye-candy department, but we’ve come across an excellent replacement utility with awesome, gigantic previews that show you exactly what window you are switching to. This is what Windows should have been built with in the first place. It’s a little difficult to showcase how well this thing works with a screenshot, but you can see the partially transparent Alt-Tab switcher window, complete with a massive preview window and the window titles easily readable. 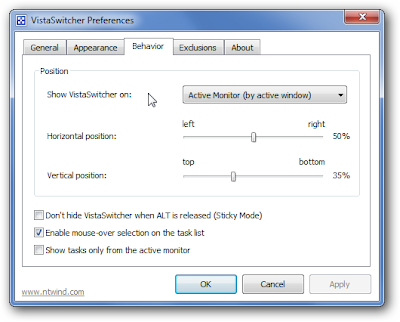 VistaSwitcher works on XP, Vista, and Windows 7… but it really works best on a system with Aero support, since the Compositing Desktop Window Manager (DWM) built into Windows Vista and Windows 7 makes it run silky smooth. 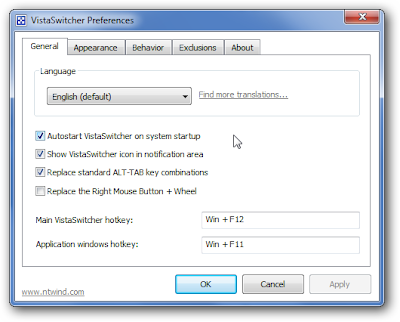 Once you’ve brought up the Alt-Tab dialog, you can use the “S” key to select more than one window at a time—and then you can use the C, V, or H keys to either Cascade, Tile Vertically, or Tile Horizontally for just the windows that you’ve selected. The X key will close them, or the M key will minimize them… there’s actually a whole set of hotkeys that you can use to manipulate open windows. 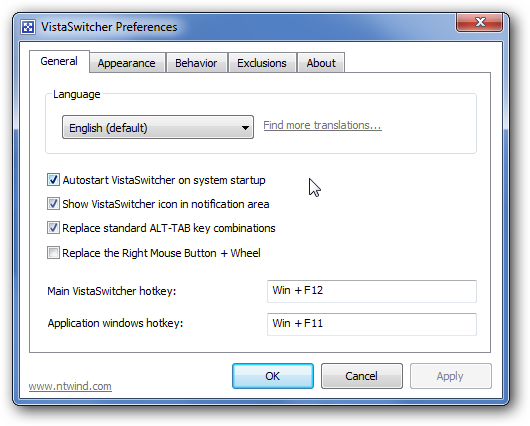 One of the few features that I’ve always been jealous of from the Mac OS X operating system is the Alt+` shortcut key that switches between open windows of a single application—and now with VistaSwitcher, I’ve got that feature on Windows. Just hit the Ctrl+Alt+Tab shortcut key combination, and you’ll be able to switch between just windows from that same process—in my case, I’m switching between open Google Chrome windows. Awesome Tip: If you head into the preferences, you can re-map the “Application windows hotkey” to Alt+` and get the same feature built into Mac OS X – it will allow you to just switch between open windows of the same type. Want to tweak the preview screenshot size? No problem, just crank the width and height up a bit, and slowly increase the number of items value. You’ll have to tweak the settings for your own personal preferences, but having a full-size switcher makes it really easy to flip between applications. For my 1920×1080 display, I changed the item width to 600, the item height to 42, and number of items to 15. This ended up giving me a switcher window that was nearly full-screen, making switching between applications so much easier. The “Window” style setting changes the preview window from being a full view of the desktop, and just showing the window itself. In my testing that didn’t work as well, but since the app is still in beta it doesn’t seem like a big problem. VistaSwitcher actually has support for multiple monitors, so you can filter tasks for just the monitor you are on. Excellent! 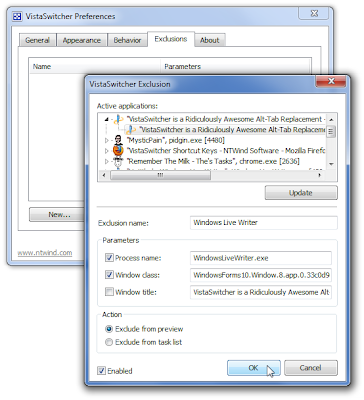 The Exclusions tab lets you filter some applications from the preview, or exclude from the task list entirely. It’s an excellent additional feature to an already excellent application. Yeah, if you don’t like awesome eye-candy and increased usability this might not be the thing for you. Otherwise, you should at least give it a test drive. It’s still in beta, so there’s a possibility of crashing here or there, but NTWind Software is a very reputable website—we’ve been using their utilities for years on all of our PCs here at HTG HQ.